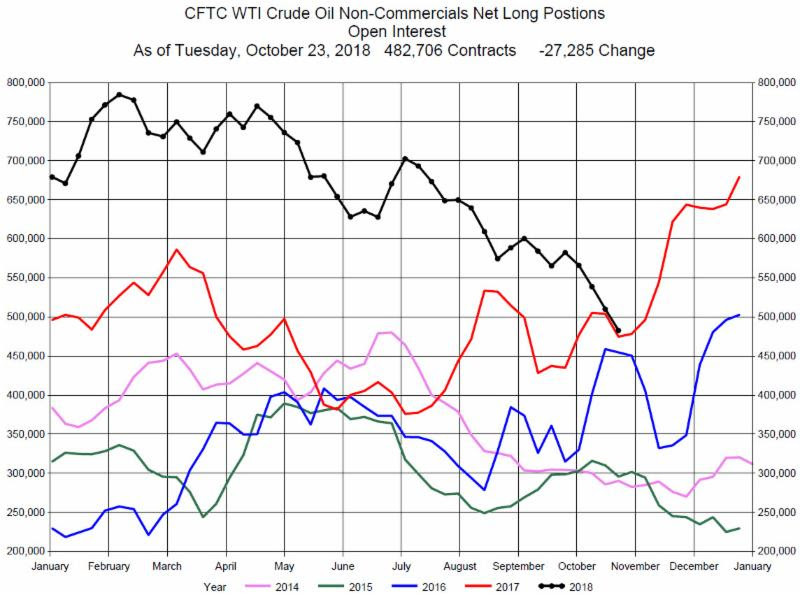 The latest CFTC Commitment of Traders Report as of Tuesday, October 23, 2018 shows the Non-Commercials Net Long Positions decreased during the week by 27.285 contracts to 482,706 contracts. A significant 20,977 Long positions were closed and 6,308 Short positions were established. Funds continue closing their Long positions and are adding new Short positions. From this perspective the Funds are part of the bearish sentiment in the market. The complete sanctions on Iran go in effect in 10 days, and there are still competing views on the effect of the sanctions as well as on world surplus or shortage of crude supplies. OPEC, in particular Saudi Arabia, has promised to make up for lost supply from Iran but there are skeptics who believe this will not be sufficient. We do not have strong position on crude oil price direction and recommend consideration of staying on the sidelines until the geo-political issues are clarified.